FLORENCE, S.C. – South Carolina hasn’t seen a boll weevil in 13 years, but cotton farmers are taking no chances. At the annual meeting of the South Carolina Boll Weevil Eradication Foundation in Florence, the farmer-run organization prepared for the next step in the battle against the historic scourge of Southern agriculture: Having pushed the pest west, farmers are making a stand at the Rio Grande. Brumley warned the group that an unexpectedly high number of boll weevils appeared this year in traps in South Texas, where farmers and government officials have set up a buffer zone to keep the bugs from re-infesting U.S. cotton fields. With funds paid by cotton farmers, the Boll Weevil Eradication Program began with trials in Virginia in 1978 to exterminate the pest. Working state by state through the following decades, the program methodically forced the boll weevil back to Mexico, where it now is contained by a South Texas buffer zone with a barrage of pesticide applications triggered by an early warning system of weevil traps. Traps are maintained wherever cotton is grown — an essential precaution because boll weevils are highly mobile bugs that can easily hitch a ride to another field or across the country by squirreling away in farm equipment. Re-infestation would be devastating to the economy. Nationally, the cotton crop fetches about $6 billion a year. Cotton is South Carolina’s most valuable field crop, earning about a quarter-billion dollars each season and covering as many as 300,000 acres. The boll weevil has proved a formidable foe in the past. When it first entered the United States from Mexico across the Rio Grande in 1892, it spread rapidly through the South, laying waste to many fields and costing the region an estimated $13 billion in lost production through the years. 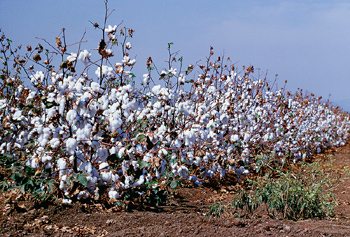 Cotton growers fund the eradication program through per-acre fee: $1.25 in 2013, rising by 50 cents next year to cover the cost of the buffer zone in the Rio Grande Valley. “When farmers complain about the cost of the buffer zone, I always ask if they were cotton farmers in the ’70s and ’80s, because I scouted cotton back then and I can tell you, you don’t want the boll weevil back,” said Randy Lynch, who leads the South Carolina boll weevil eradication effort. It’s fitting that the foundation meeting at Clemson’s Pee Dee Research and Education Center was his final official duty for the university, because Howle and cotton go back a long way. As a teenager growing up in Hartsville, he earned money for his Clemson tuition by working as an assistant plant breeder for Coker’s Pedigreed Seed Co. in his hometown. His college agronomy study — bachelor’s and master’s degrees at Clemson and a doctorate at the University of Arkansas — focused on small grains and soybeans. But he never lost his affinity for cotton. Fresh out of his Ph.D. program, Howle joined Oklahoma State University as an Extension small grain specialist. Carolina roads eventually called him home. He returned to Coker — with a side trip to Mississippi when the company was sold — and settled back home for good in 1990 when he joined Clemson as head of fertilizer and seed certification. The past 23 years have led him through a variety of leadership jobs in Clemson’s regulatory unit, including a stint as its interim director. Howle leaves the boll weevil program in a healthy position to continue protecting the state’s growing cotton industry. “I can’t think of any better collaboration of research, extension, growers, industry and regulatory, all working together to get something done,” he said.